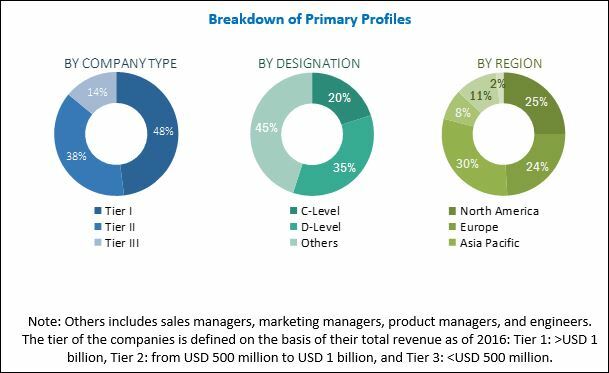 [169 Pages report] The global industrial filtration market was valued at USD 24.33 Billion in 2017 and is projected to reach USD 35.47 Billion by 2023, at a CAGR of 6.50% during the forecast period. This research study involved the use of extensive secondary sources, directories, journals on power generation technologies, and other related markets; newsletters and databases such as D&B, Bloomberg, Businessweek, and Factiva, to identify and collect information useful for a technical, market-oriented, and commercial study of the global variable speed generator market. The primary sources include several industry experts from the core and related industries, vendors, preferred suppliers, technology developers, alliances, and organizations related to all the segments of this industry’s value chain. The research methodology has been explained below. After arriving at the overall market size, the total market was split into several segments and subsegments. The figure given below illustrates the breakdown of primary interviews conducted during the research study based on company type, designation, and region. Major players operating in the market include Alfa Laval (Sweden), Ahlstrom-Munksjö (Finland), Donaldson (US), Eaton (Ireland), Freudenberg (Germany), Mann+Hummel (Germany), Pall Corporation (US), and Parker Hannifin Corporation (US). The global industrial filtration market is projected to reach USD 35.47 Billion by 2023, growing at a CAGR of 6.50%, from an estimated USD 25.89 Billion in 2018. This growth can be attributed to the growth in industrialization and urbanization, stringent regulations pertaining to emissions and treatment of industrial waste, and requirement of safe working environment in industrial facilities. On the basis of industry, the industrial filtration market is segmented into manufacturing, power generation, oil & gas, pharmaceuticals, metals & mining, and process industry. The pharmaceutical industry is expected to grow at the highest CAGR during the forecast period. This industry uses filtration for removal of suspended particles and to reduce bacteria in process components. The choice of filter media for the pharmaceuticals industry depends on the size of particle to be retained by the medium, permeability of the clean medium, solid-holding capacity of the medium, and the resistance to fluid flow of the used medium. The industrial filtration market, by type, is segmented into liquid and air. The air filtration market is expected to grow at the highest CAGR during the forecast period. Strict government regulations to curb air pollution is expected to drive the growth of the air-type industrial filtration market. Furthermore, the market for mechanical filtration, by technology is expected to be the largest market and the market for electrostatic precipitator, by product is estimated to be the largest. 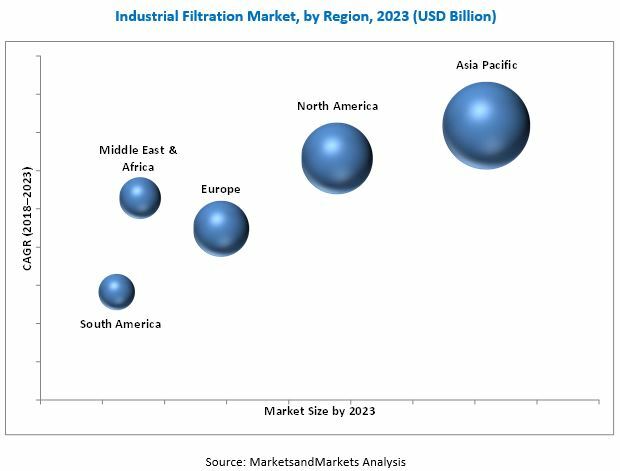 The industrial filtration market, by filter media, is segmented into activated carbon/charcoal, fiber glass, filter paper, metal, and nonwoven fabric. Nonwoven fabric, by filter media, for industrial filtration is expected to grow at the highest CAGR from 2018 to 2023. These nonwoven fabric filter bags are made from nonwoven Polypropylene (PP) fabric and are durable, reusable, water-resistant, hypoallergenic, fire-resistant, soft, light, and sometimes washable. These bags are used in various end-user industries, such as pharmaceuticals and mineral processing. In this report, the industrial filtration market has been analyzed with respect to 5 regions, namely, North America, Europe, Asia Pacific, South America, and the Middle East & Africa. Asia Pacific is expected to account for the largest market share of the global industrial filtration market in 2018. Emission regulations accompanied with the need for clean indoor air facilities is one of the major factors that drives this market in the region. Moreover, the growth in manufacturing, power generation, oil & gas, and food & beverage industries has laid a great influence in the economic development of the countries in the region. Government initiatives such as Industry 4.0 and Internet Plus are attracting heavy investments toward the manufacturing sector. China is expected to see an 8.5% year-on-year growth in software spending to undergo waves of automation and digitalization and accomplish its “Made in China 2025” initiative. India is also expected to grow at the fastest pace. The “Make in India” campaign is expected to boost the growth of the manufacturing sector in the country by leading the supply chain management which is expected to grow at a 14% CAGR during 2015–2019. Thus, all the efforts taken by the countries to advance their economic growth are likely to contribute to the industrial filtration market as countries are obliged to abide by the stringent government norms for emission control. The slow industrial growth in China and growth in renewable energy sources could act as restraints for the industrial filtration market. The leading players in the market include Alfa Laval (Sweden), Ahlstrom-Munksjö (Finland), Donaldson (US), Eaton (Ireland), Freudenberg (Germany), Mann+Hummel (Germany), Pall Corporation (US), and Parker Hannifin (US). New product development was the most commonly adopted strategy by the top players. This was followed by mergers & acquisitions, investments & expansions, joint ventures, and partnerships & collaborations.